When my kids were learning to talk, they would often make up words to overcome shortcomings in their vocabularies. They knew, for example, that baby dogs were called “puppies.” But since they didn’t yet know “foal,” a baby horse was called a “horse puppy.” Similarly, when my wife needed an oil change, she would go to the “car doctor.” It didn’t bother them that no one else used these terms. They described the places and things that they needed to using the words they had. Looking back on it, it reminds me of Randall Munroe’s Up Goer Five, in which the XKCD author explains how the Saturn V rocket worked, using only the 1000 most-used words in the English language. Cognitively, the children were taking new ideas (there’s a place where we go to get the car fixed) and attaching it to what they already know (when I get sick, I go to the doctor). Later, they refined their understanding. Doctors are only for things that are alive. Cars are not alive. A car doctor is called a mechanic. Each of these pieces of information allowed them to augment their understanding. The result was learning. In order to develop understanding, we have to find ways to connect new information to things we already know. For example, let’s say that I know that high blood pressure can increase my risk of developing diabetes. My doctor tells me that sodium intake affects blood pressure. So I can reasonably conclude that reducing my salt intake can lower my risk of developing diabetes. Maybe I reduce the amount of salt in my diet, and my blood pressure does go down. So I’ve instilled a belief now. I’m healthier because I’ve made that one dietary change, and I’m less likely to develop diabetes. But now what happens when I encounter contrary evidence? Maybe someone tweets a link to a news story saying that the benefits of reducing salt are overstated. Or maybe there’s a doctor who writes an article about how reducing sodium tends to increase fat and sugar, which cause more harm than the sodium. Or I see a Facebook post about the restorative power of sea salt. If my belief in the link between sodium and diabetes is strong enough, I will just reject this new information. There’s no way to fit it into my existing understanding. These people must be crazy. I start questioning their credibility. I look for ulterior motives. I start trying to find flaws in their research or reasoning. If I’m already convinced that sodium and diabetes are linked, then I embrace evidence that supports that belief, and reject evidence the contradicts that belief. In order to change my mind, you have to find a way to attach new information to my existing understanding that doesn’t contradict everything I already know. Maybe you could point out that most people who have diabetes also have high blood pressure, but that millions of people with high blood pressure don’t develop diabetes. As it turns out, diabetes may be a contributing factor to high blood pressure, not the other way around. Or maybe you can find other examples where correlation does not imply causation, and plant a seed to restructure my understanding of diabetes and blood pressure. But ultimately, you’re not going to be able to convince me that everything I know is wrong. That would require me to admit that I’m a fool, and I’m not willing to do that. But on the other side of the coin, I have to be aware that the lens through which I see the world is shaped by my experiences, my beliefs, and the understanding that I have built. And because my lens is different from your lens, our views of truth and belief and reality will necessarily be different. Just knowing that, though, gives us hope. Recognizing that we have different perspectives, and that I might only be right 90% of the time instead of 100% of the time, means that there’s now room in my lens for contrary ideas. I should point out, by the way, that as far as I know, high blood pressure does not cause diabetes. Also, in my own experience, reducing sodium does not cause a decrease in blood pressure. Your mileage may vary. Author John SchinkerPosted on March 21, 2017 Categories UncategorizedTags diabetes, discourse, health, knowledge, language, learning, understanding1 Comment on What Do You Know? Daryl Davis is a piano player. In 1983, he was playing country and western music in a bar in Virginia. A patron came up to him and remarked that it was the first time he had ever heard a black man play piano as well as Jerry Lee Lewis. Davis explained that Lewis had learned to play from black boogie woogie and blues piano players. The man was unconvinced. Davis explained that Jerry Lee was a friend of his, and the two had discussed his influences many times. The two struck up a conversation, and the man admitted that he was a member of the KKK. Eventually, Davis met with several high-ranking klan members, and even befriended some of them. He found that many klansmen had strong, deep-seeded misconceptions about black people. By forging respectful relationships with them, he was able to counter the stereotypes. It’s harder to hate a group when you know and respect someone who is part of that group. A few years ago, Davis told his story to Nick Van der Kolk on the excellent Love & Radio podcast. You should invest 40 minutes and go listen to it. It’s a compelling and entertaining and amazing story. But when you’re done, come back. Because there’s more. A couple weeks ago, Davis returned to Love & Radio. We seem to be in a world where there are more divisions among us than ever before. And he’s an expert at working to bridge those divides. So we should listen to what he has to say. Go listen to that one, too. Or, if you have to, just read my notes. These are Daryl Davis’s ideas, as told to Nick Van der Kolk, listened to by me, and summarized for you. So how do you have a civil conversation with someone you disagree with? Do your homework. Before going in, know what their position is. Learn as much as you can about their argument, the reasons behind their beliefs. Ideally, you should be able to make their argument as well as you can make your own. Have a conversation, not a debate. If you have a debate, it’s about convincing the other side that you’re right. It’s argumentative and confrontational , and it’s very unlikely that you’re going to be able to change their mind. Instead, invite them to have a conversation. Go in with the idea that you want to understand why they feel the way they do. Give them a safe space to explain themselves. Look for common ground. You agree on something. You can find some area where you’re both on the same page. I was discussing the Affordable Care Act with someone a few months ago, and we were on diametrically opposite sides of the issue. Finally, I looked for common ground. “Can we agree,” I asked, “that when someone gets in a car accident and goes to the hospital, we’re not going to refuse to treat them?” He agreed. Great. All we need to do, then, is figure out how to pay for it. By finding some common ground, you start to build a connection. The more you do that, the less important the differences become. Talking is not fighting. When you’re talking, you’re not fighting. You might become animated. There might be some yelling or fists pounding on the table. But there’s no violence. The violence doesn’t start until the talking stops. As long as you keep talking, you’re okay. Be patient. You’re not going to convert someone overnight. Whatever the issue is, there are roots underneath it. You’re not going to spend an hour discussing abortion or immigration or social programs and convince them to change their mind. But maybe you can give them one thing that they’ll think about later. Give them one little reason to just move their position an inch. Be pro-active. Talk to people who disagree with you. Learn from them, and give them the opportunity to learn from you. Avoid condescension. Don’t be insulting. You will hear opinions that you don’t like. Everyone is entitled to their opinions, and remember that you’re giving them a safe space to express them. But everyone is not entitled to their own facts. When they say something that is untrue, call them on it. Ask for evidence of their claim. Or, if you have evidence that counters their point, share it. Correct the facts, but don’t be mean about it. I think maybe it’s time to venture out of our bubbles and echo chambers once in a while to try to have some real conversations. I’ll close my HuffPo and Mother Jones browser tabs for a little while. Maybe you can stop listening to Breitbart and Fox News for a couple hours. And we can look for common ground. Photo credit: Martha Soukup on Flickr. It’s a funny thing about social media. Sometimes, it can be kind of social. That’s fantastic. It’s great for democracy. It’s a monumental shift in how information is managed. It changes the structure of power. Everyone has the means to widely disseminate ideas. Everyone has the ability to engage in the conversation. Everyone can reach a global audience. The gatekeepers are gone. No one is determining which ideas are good enough for wide distribution. No one is controlling the message. lf, is good. But we’ve lost much of the civility of engaging in the community. Somewhere along the way, everyone started talking and stopped listening. A year or so ago, a social news experiment called Patch started to catch on. The idea was to fill the local news vacuum in small communities. Local editors were recruited to attend city council and school board meetings. They wrote of short pieces of a hyper-local nature. Readers were encouraged to participate. There were lots of open-ended questions and prompts for discussion. Residents could share their news as well. The editor curated the content, and through the comments, the whole community could participate. Originally, Patch had a policy that required people to use their real names. They wanted you to participate, but they also wanted you to be accountable for your words. So users with anonymous handles were politely asked to add their names to their profiles. As time went on, this became harder and harder to enforce. At some point last summer, a policy change allowed people to be anonymous on Patch. Since they couldn’t enforce the rules, they changed them. Participation soared. Advertising revenue (I’m assuming) went up. All was good. But the level of discourse took a nose dive. No longer hindered by their reputations, users migrated to extremes. The comments quickly devolved into pointless vitriol and personal attacks. I stopped commenting. Then, I stopped reading. 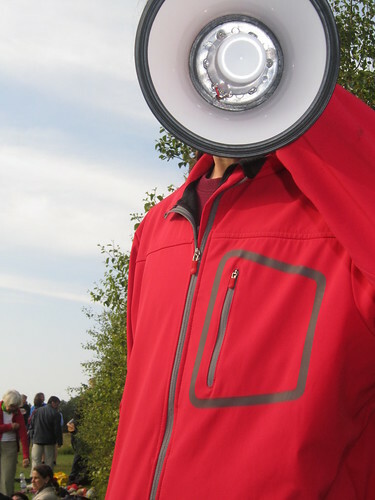 It turns out that the allure of the anonymous megaphone is strong enough to overcome any sense of civic responsibility to the community. nference of conversations, centered on getting smart people in the same place at the same time to discuss big issues in education. While the sessions are carefully planned by the facilitators, they involve an enormous degree of interactivity. There are no audience members. Everyone is a participant. This year, for the first time, I saw participants with megaphones. Rather than respecting the norms of the community and participating in civil discourse around the topics of the sessions, a very small minority brought their own agendas, and attempted to steer every conversation toward their theses. Pearson is evil. Common Core will destroy American education. The Internet is full of predators and too dangerous for children to use. Fine. Bring your arguments. Let’s have a conversation. But it got to the point where nearly every session devolved into soapboxing by the same people on the same topics. That’s not respecting the community. And now, this brings us to EdCamp. In a few weeks, we’re hosting this opportunity for anyone interested in education to come together to discuss the topics that are important to them. The attendees will determine the schedule for the day. You’ve probably already heard all about it. If you need more info or want to come, check out the web site. But I’m worried about conversations being hijacked. EdCamp is a community of convenience. It’s not a place where the same group of people has been interacting and has formed a community with standards of behavior. Maybe it will become that some day, but right now, it’s just a diverse bunch of people. There’s already some evidence that a vocal minority is bringing megaphones to EdCamps with the goal of preaching their own personal Gospels. We’re doing a few things to try to give everyone a voice. The web site is featuring a series of Participant Perspectives, highlighting people who are coming to EdCamp and giving some background about who they are and why they’re attending. The goal is to raise the level of discourse, and to highlight the diversity of the attendees. There are also some posts that go into more detail on what an unconference is, how the day will be structured, and what people can expect when they come. The idea is to build some expectations among the attendees, who are ultimately the only ones who can ensure that everyone has a voice. Finally, we’re not going to build the session schedule ahead of time. Over the last year or so, several EdCamps have opened the board a day or two in advance, so people can start scheduling sessions. This just encourages people to bring their leftover presentations from other conferences. While we may solicit ideas for topics ahead of time, nothing is going on the schedule until the day of the event. All of this involves listening more than talking. The most important part of the conversation is not what you’re saying, but how you’re reacting to the things that others are saying. Sometimes, it’s easy to lose the conversation skills when there are so many megaphones around. I hope that the education community can reach a level of civility and discourse that’s not being modeled in the wider society. I’m sure we’re up to the task. But we have to start by listening. Photo credit: The Infatuated on Flickr.